A BBC team led by chief international correspondent Lyse Doucet that visited Qusayr yesterday found that it was in ruins. The rebels, she remarks, "say they're coming back but they'll come back to a city that's gone." Doucet and the team she led were taken to Qusayr by the Syrian government. They were the first Western journalists to reach the city, and said they did not see a single building that had escaped damage. The town where some 30,000 people once lived is now all but deserted by civilians. Qusayr lies only 10 kilometers from the Lebanese border and is close to important supply routes for both the government and rebels. It had been the focus of a three-week battle between rebels and government troops backed by fighters from Iran’s Lebanese Shiite militia Hezbollah. Doucet says both Syrian troops and Hezbollah fighters were everywhere - travelling in trucks and armored vehicles, firing guns in celebration and moving on foot through the streets. This battle for Qusayr is over. But now the fight begins to help the people who survived. Thousands fled the violence; many were trapped inside. Aid agencies speak of alarming reports that large numbers of wounded need urgent care. There's not enough food or water in Qusayr or for those displaced outside in schools, shelters and on the streets. In the last two days, the UN managed to send in a powerful generator to help restart the main pumping station for this entire region. But now aid agencies are urging the government to give them greater access to the city. The fight for Qusayr was a strategic victory, but a humanitarian disaster. Offering sweets and waving Hezbollah flags in Beirut’s southern suburbs to celebrate the devastation of Qusayr and the displacement of the Syrian town’s people is no less ugly than the sight of women and children fleeing the siege and killings inferno. After failing for 20 days to overrun the town of 40,000, most of them women and children, Hezbollah and the Syrian air force proceeded to raze Qusayr with mortars, Scuds and 80 airstrikes. Hezbollah and Iran won Qusayr but lost the whole Arab world. The Arab street feels more determined today than ever before to rid Syria of its regime and its allied Iranian, Iraqi and Hezbollah forces. Distributing sweets in the Beirut suburbs and banging drums of victory in Tehran deadened the feeble voices that may have supported the negotiation of a political solution at Geneva-2. Does the fall of Qusayr mean Assad prevailing and the Syrian revolution ending? No, certainly not. The insurgents in Syria are not U.S. forces in Iraq or Afghanistan who are set to leave one day. They are an overwhelming majority of Syrians. Where would more than 15 million Syrians go? How would Hezbollah kill them off, when it suffered scores of casualties and spent three weeks battling to capture a small township like Qusayr? Syria’s war is a genuine popular war that can only be compared to the wars of the Algerians against the French and the Palestinians against the Israelis. Do Hezbollah and Iran plan to occupy Syria, and if so for how long? To see the Syrian regime, Hezbollah and Iran celebrate “victory” against “Takfiris” in Qusayr is tragicomic at best. Hezbollah falsely claims to be a resistance (to Israel) party. The Iraqi Shiite militias in turn pretend to come from under the cloak of Iraq, a state faking to be democratic. Sponsored by Iran’s sate institutions, they all flocked to Syria to shore up its bloody, criminal and sectarian regime. This is the opposite of what al-Qaeda and Jabhat al-Nusra are doing. The two groups intervened short of international backing and political party umbrellas. The future looks bleak and warrants ample alertness and preparedness. Fighting under the banner of Imam Hussein puts paid to all false slogans in our region. It heralds a new chapter in which Assad’s survival is not a menace to the Syrians’ security only, but to social peace all through the region as well. Assad and his allies are a bigger threat than al-Qaeda, Jabhat al-Nusra and all the criminal regimes our modern history has known. All regional and international stands seem detached from the tragic Syrian reality. This means the crisis will be long-drawn-out. Its savage episodes will continue until Syria and Syrians are bled to death. America is detached from reality – not because John Kerry claims Washington was “late” coming to a political process, but because America deliberately chose to sit out the crisis until Syria was destroyed and additional extremists were killed. Throughout 27 months of bloodshed, Barack Obama sat on the sidelines ruminating his calls for Assad to stand down simply to justify his ban on arming the rebels. Iran is detached from reality when she imagines her chances, and those of her Lebanese and Iraqi proxies, in Syria will be better than America’s in Vietnam, Afghanistan and Iraq. The Arab League is detached from reality when it suffices with giving Syria’s seat to the opposition without threatening to sever ties with Russia for standing sentinel to protect the massacre of the century. Whatever the case may be, and notwithstanding the importance of Qusayr in the open-ended Syria war, the regime’s drive to recapture areas under Syrian opposition control remains thorny and long. It is most unlikely the regime would win a decisive military victory. What the regime has done is push back the opposition and force it to scale down its expectations. Today, the regime and its allies are on the offensive while the political and armed oppositions are on their back foot. And that’s how it will be from hereon -- short of an upset in the quality, quantity, logistical support and training the opposition receives from its Arab, regional and international allies in the next phase. 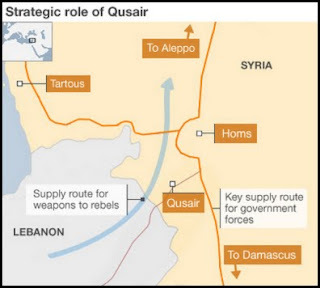 Post-Qusayr, the regime and its Hezbollah allies are likely to try “mopping up” the Syria-Lebanon border areas. They would tighten their hold on them to cut off the opposition’s supply, reinforcement and smuggling routes to the Syrian interior. That’s easier done now. 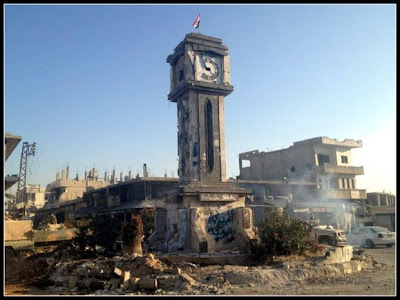 Rebel-held Homs neighborhoods are next for regime and Hezbollah forces. I trust a decisive Homs victory is much more likely after Qusayr. Battles of s strategic nature will then take place in Aleppo province’s urban and rural areas. Clearing up the vital backup support arteries along Syria’s frontier with its northern neighbor, Turkey, would follow. The regime is aware of the difficulty of tracking down the armed opposition in every village and township across Syria. It would feel a conquistador once it succeeds in regaining control of the big cities, where the opposition maintains footholds such as in Aleppo and Homs, and of the international highways linking the major provinces with the coastline and Damascus. The regime is out to achieve this as quickly as possible before Moscow and Washington stop splitting hairs over Geneva-2. But the regime is bent on doing just that whether Geneva-2 sees the light or not.